Breakfast buffet and back on the bus [with a bumbling bunch of babbling baboons]. There were 40 of us, being shepherded by Stuart. He has a good sense of humor, but takes no nonsense. He made it clear from the get-go that he would only be responsible for 1 [one] suitcase, properly labeled, for each of us. As the trip progressed, it was quite amazing how luggage increased exponentially. Not us; we were following our new paradigm of ‘light and small” gifts and souvenirs. But I digress. 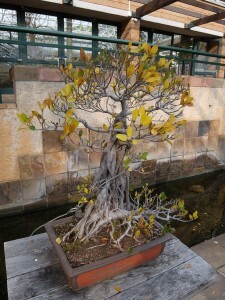 We made for Kirstenbosch National Botanical Garden, on the slopes of Table Mtn. We had to assume it was still there, as the cloud tablecloth had settled down on top. We rejoiced again that Stuart had got us there yesterday. 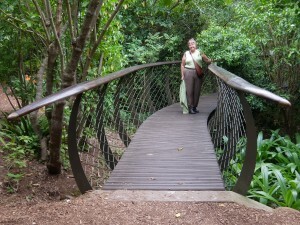 Kirstenbosch is enormous and we had only 3 hours there, so we headed past the Bonsai toward the Tree Canopy Walkway by way of the Conservatory. Cecil Rhodes [miner and founder of DeBeers Diamonds] was the last to own the land, though he didn’t live there for long. He bequeathed it to the nation for the public. In this it reminds me of the Huntington family, Getty and the Rockefellers. The rich earneth and they giveth back. There were very few folks there on a weekday morning: a few enthusiasts offering to share their knowledge; a group of birders with cameras; mothers and toddlers. And 40 Americans. 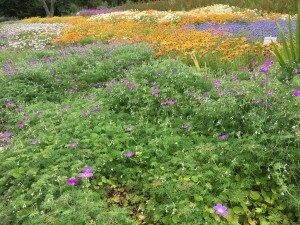 As I mentioned last blog, West South Africa is its own floral kingdom and the Garden was one of the best places to get the feel for this. 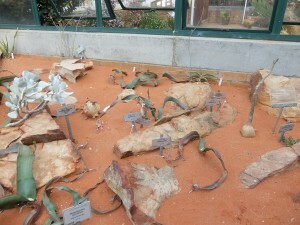 The Conservatory featured strange desert plants native in the Kalahari to the north. 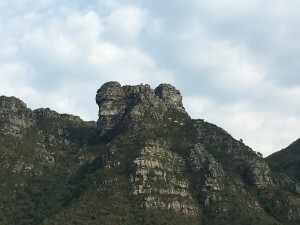 I spotted “Mickey Mouse Rock” which the map thought was “Castle Rock”. Does this look like a castle to you? The Tree Canopy Walkway had just opened recently and is unique. A slightly swaying bridge meandered around the tree tops, allowing the visitor to see down 30 feet to the forest floor, while appreciating the tree tops. 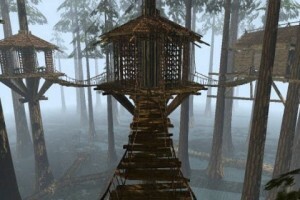 If you ever played “MYST” you have seen such a walkway. Returning to the entrance, we passed a flock of birders avidly scanning the bushes. Suddenly I saw an animal in the shrubs!! Then I saw it was a gardener on her hands and knees, laughing at me. The gift shop was very fine and I bought little zip up containers made from the ends of water bottles and decoupaged with fabric [or paper?]. Recycling is big in SA. Our bus then took us to Bo Kaap neighborhood on the slopes of the "City Bowl", so called because the mountains form a natural ampitheater for the center of town. 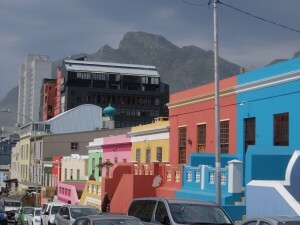 Bo Kaap means "above the cape". These row houses were originally homes for freed slaves, who celebrated by making each one unique in color and decor. Now, they are being bought up by downtown businessmen who fancy a quickie with the mistress before going home-- no, no, I mean who sometimes work very late and must stay in town for the night. We saw some of the gorgeous women who--no doubt-- are the housekeepers for such businessmen. They ran everyone else off the sidewalk; the men of our town were suddenly open-mouthed and mesmerized. Back on the bus, we headed for Victoria Reef, the enormous waterside shopping mall of Cape Town. It was very upscale and none of the stores had clothes even approaching my size. Even Woolworth, which in SA is a boring clothing store, not a fascinating 5 and Dime with a lunch counter. Upscale malls are good for one thing—Pylones! We discovered this funky place in Paris years ago and have visited one in Tornino, NYC and Amsterdam. They are quite pricey, but we bought a frog-shaped egg-separator for our son. And how I wish could have brought one for YOU. Heading out the back door, however, we found a delightful balcony for lunch at the Greek Fisherman. Ron’s “Greek Village salad” really was = tomatoes, cukes and olives, no lettuce. I had “lamb shavings” which was not wool but meat, thank goodness. 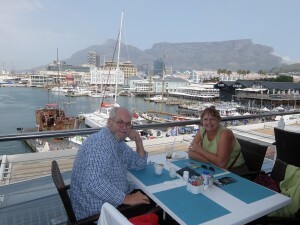 From our table, we could see the working harbor: school kids in uniform going on boats to tour; ship repair [we found out later that Cape Town is the Hampton Roads of Africa] ; many more shops and a great deal of bustle. Just during lunch, the weather changed over and over, revealing then concealing Table Mtn. 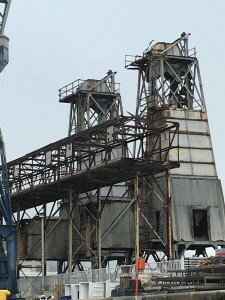 After lunch we took a 30 minute harbor tour featuring some old time cranes and the roads full of shipping. [I really love shipping and freight]. 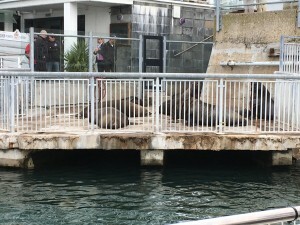 Moving along the harbor, we saw seals lounging in a fenced area, free to come and go. We found the most wonderful place called African Trading Company. It being only our second day in Africa, we were afraid to buy much, but the prices were amazingly low. In fact, we had a very good exchange rate all during this trip. I have actually never read Stephen King; I find his premises to be most irritating. 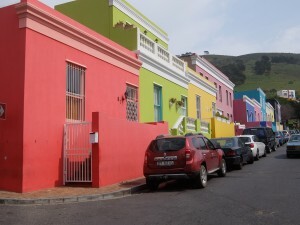 We didn't see any brochures for Bo Kaap. Why did you need a pied a terre? Vibrant colors are very popular among Africans and Indians, all around the world.